Help your group become more connected and productive. Dynamix's Teambuilding for Teens brings you an intense series of team challenges that are specially designed for adolescents. This exciting experience will be thought-provoking, educational and a great time for all! 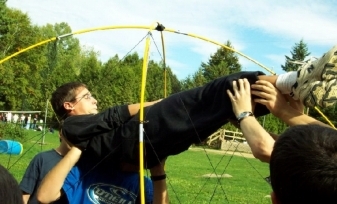 Get your entire team through the giant spider's web without ever touching the webbing! Get ready to lift and be lifted as you put your trust in your team's hands. Collect all the items in the danger zone by setting up a secure line for your teammates to shuffle across. Support and planning and the keys to success!